bringing about fundamental changes in the way that we live and act. 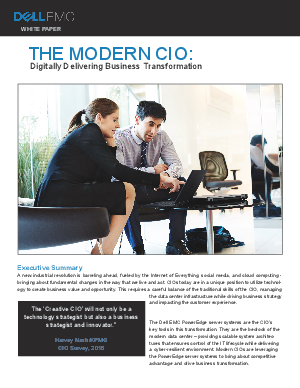 CIOs today are in a unique position to utilize technology to create business value and opportunity. This requires a careful balance of the traditional skills of the CIO, managing the data center infrastructure while driving business strategy and impacting the customer experience. Learn more about Dell EMC enterprise solutions in collaboration with Intel®.